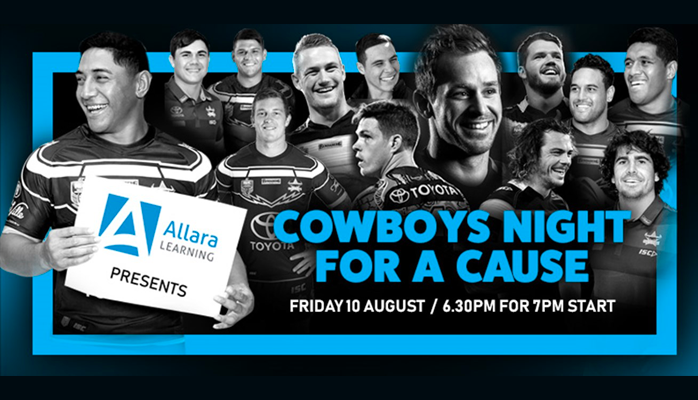 Guests who attend the upcoming ‘Cowboys Night for a Cause’ fundraising event can expect to be served by John Asiata, Coen Hess, Michael Morgan, Jake Granville, Ben Hampton, Jason Taumalolo, Josh Chudleigh, Ethan Lowe, Lachlan Coote, Antonio Winterstein, Shane Wright, Jake Clifford and Carlin Anderson. The fundraising event is a capstone activity within the Double Diploma in Business and Hospitality and gives enrolled players the opportunity to put into practice what they learn in the classroom. Allara Learning Queensland state manager Arthur Burchett said that the event is a culminating experience for the Cowboys players who have worked hard to acquire real-life skills. “It’s a one-of-a-kind event that enables us to showcase the different talents of players and will provide the opportunity to feature an auction to raise funds,” Burchett said. The event includes a pre-dinner performance by Miella Sartori, an exclusive memorabilia and hosted experiences auction, an appearance from comedian/magician Adam Dean, and singer Jade Holland performing under the stars. Proceeds of the event will go to seven charities which have been chosen by the players, including Headspace, Livin, Multicap, Ronald McDonald House, Epilepsy, NRL Cowboys House and the Pyjama Foundation. Cowboys player Michael Morgan has nominated Headspace as one of the beneficiaries of funds raised at the event. “Doing study outside training and playing for the Cowboys lets me learn skills that will be useful for life after football. It gives me the chance to work towards achieving qualifications that will further myself and allow me to be a role model both on and off the field. Being able to do this event and help Headspace, a charity closet to my heart, is a win-win situation for me”. The fundraising event will be on Friday 10 August in Townsville, for tickets and further information go to: www.eventbrite.com/e/cowboys-night-for-a-cause-tickets-47702870570.